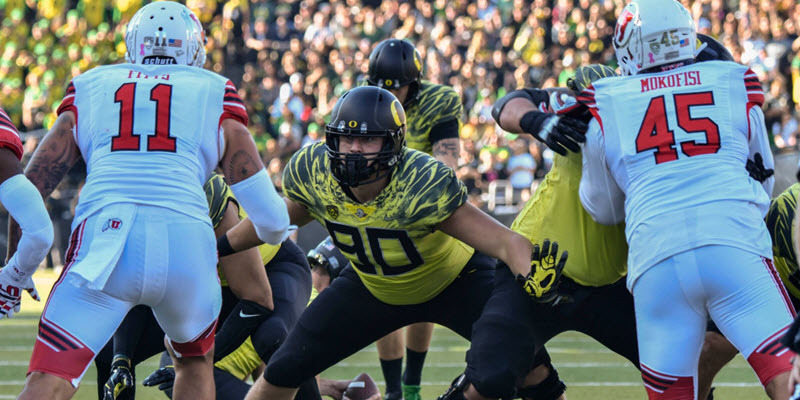 After we covered Jim Leavitt‘s overall structure in our first analysis, we will now get into where it all starts: up front and in the middle. While Jim Leavitt primarily runs what we will be calling a 3-4 Base defensive front, he has four others he can use situationally in order to put his players in the best position. These four others are called: (1) 3-4 Tite; (2) 3-4 Okie; (3) 3-4 Over/Under, and (4) 2-4-5 Even. 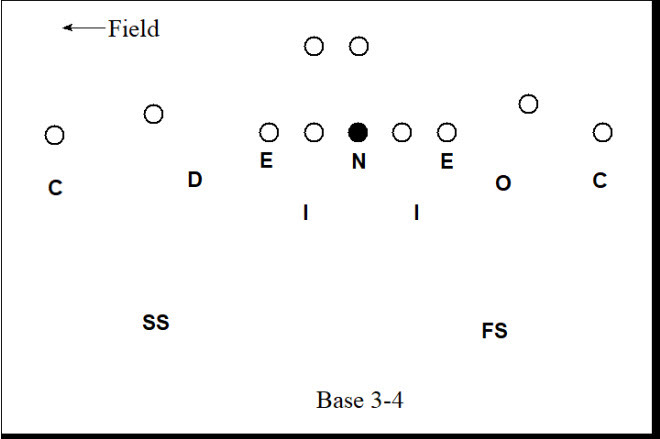 In 3-4 Base (above), the nose and two defensive ends each line up directly over an offensive lineman. The nose will align directly over the center, and each end will align directly over their respective offensive tackles. At the snap, each of the defensive linemen are asked to two-gap against any running play (i.e. ., control both gaps to either side of their alignment). The linebackers are then asked to fill based on the offensive line’s blocking scheme and the defensive linemen’s ability to take on double teams, which seems to vary based on blocking scheme. Interestingly, the nose tackle — Jordon Scott, in Oregon’s case – has the freedom to disengage with the center if he thinks he can get a clean release to the backside of the play (backside A-Gap) and attack the ball carrier directly. This can often leave the linebackers exposed to the center’s blocks, but for the Ducks, it turned out to be a solid trade-off in practice. The ends, however, have no such discretion. So if you see Jordon Scott generating a lot more havoc than his defensive end brethren (guys like Jalen Jelks and Justin Hollins), understand that scheme plays a large part in that. This is what the Grizzled Ol’ Coach called the “4-0-4” defense. In short yardage situations (above), Leavitt would frequently turn to what is most commonly called a Tite front (sometimes known as 4-0-4 front). Unlike the Base 3-4, the defensive ends will align in a 4i-technique (see below), on the inside shoulder of the offensive tackle. Further, each defender is now responsible for a single gap, except for the nose tackle, who retains 2-gap responsibility. The Ducks most commonly ran 2-Read (a form of two-high safety coverage we will discuss later) and one-high safety coverages from this front. The top numbers are techniques on defense. 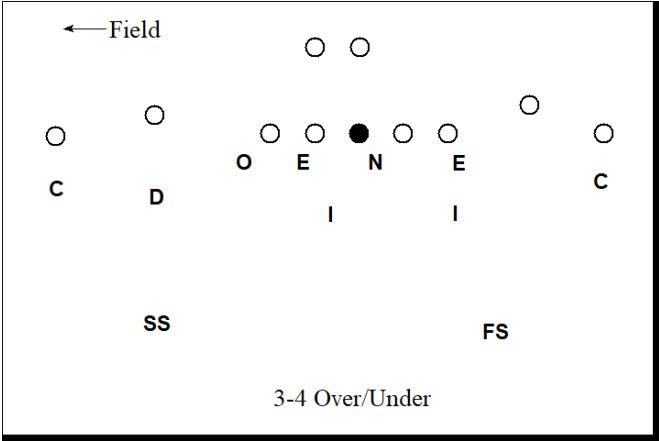 In 2nd-and-8+ or 3rd-and-6+ situations, Leavitt will often switch personnel and run what is known as an Okie front, shown above. The term ‘Okie’ gets its name from Oklahoma, which first popularized this front in the 1960s. In an Okie front, the defensive ends will align in a 5-technique on the outside shoulder of the offensive tackles. Leavitt will nearly always send one or two additional linebackers to rush the passer from this front, mixing a variety dogs and blitzes to confuse the offensive protection. While effective in that regard, it was often susceptible to draws and running plays involving pulling guards. In situations where Leavitt wanted to simplify assignments for his players, typically in short-yardage or when the defense was backed up, he ran a 3-4 Over/Under (see above). An Over front is where the defensive tackle or end will align in a 3-technique to the direction of the call (see below), typically to a tight end or the offense’s strength, and the nose will align in a 1-technique away from the call. An Under front simply has the roles reversed: the defensive tackle or end will align in a 3-technique away from the call, again typically to a tight end, and the nose will align in a 1-technique to the call (note: while Leavitt does not normally change personnel here, the boundary end will stand up like a linebacker in this front). When a tight end is present, Leavitt will run an Over front. When no tight end is present, Leavitt will primarily align the 3-tech to the running back, though not always. Leavitt ran much more of this front at Colorado (and in more varied situations), so I expect to see more of it in 2018 as the Ducks gets a better handle on Leavitt’s system. It was, however, more of a change up in 2017. The assignments in a 3-4 Over/Under are simplified in that every lineman and linebacker is only responsible for a single gap on a running play. So rather than reading the blocks like in 3-4 Base, everyone simply attacks their assigned gap once they see the offense is running the ball. 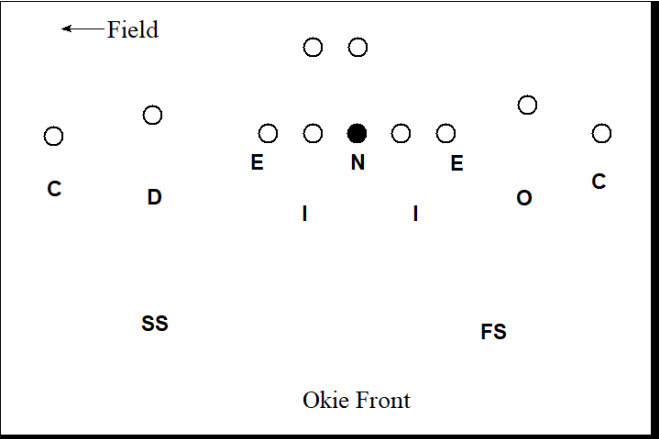 As an alternative to the Okie front in obvious passing down situations, Leavitt will run a 2-4-5 Even front as above. A 2-4-5 Even means that both defensive linemen will align in 3-techniques (outside shoulder of the guards) and both “ends” will align standing up like a linebacker. Leavitt generally, though not always, aligns the nose tackle to the boundary. For the most part, he does not mix any complicated blitzes in with this package like he does with the Okie, instead preferring to stunt with his front four. 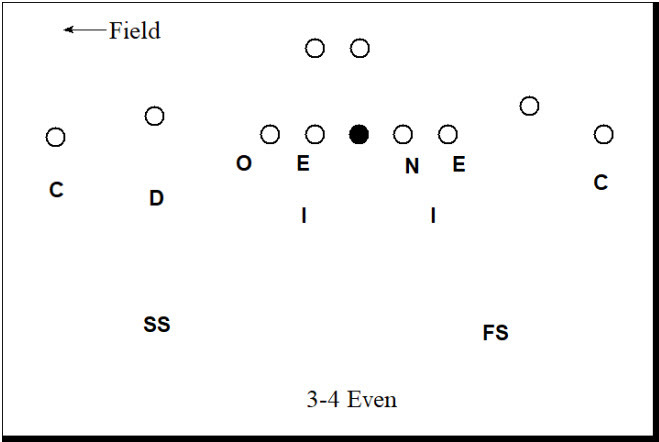 So that covers all of Leavitt’s main defensive fronts. In our next installment on Jim Leavitt’s defense, we will begin discussing his 2-high safety coverages.